Karen Lockett RN, NIP is our medical aesthetic nurse practitioner providing Confident medical and facial aesthetic treatments. She has vast experience, having started her career in the cosmetic, surgical and non surgical medical world in 1996, and has been privileged to work alongside some of the leading surgeons and practitioners from the UK and around the world. Karen is at the forefront in the use of dermal fillers for soft tissue augmentation with volumetric injection techniques, providing facial sculpting and enhancement, along with wrinkle/line relaxation, reduction and softening with the cosmetic use of Botulinum Toxin (Botox®). Since 1999 she has specialised in non surgical injectable treatments, and has trained to advanced levels. She was recruited to be one of the first trainers for Q-Med, the company which makes Restylane, and travelled around the country for 3 years in this role, training doctors, nurses and dentists in the theory, techniques and practical skills required to administer dermal fillers. Further to conventional facial aesthetic treatments, Karen is also experienced in a variety of medical aesthetic treatments including PDO thread face lifts, hyperhidrosis (sweat reduction), leg thread veins, chemical peels and derma-roller skin rejuvenation. Karen is a member of various organisations within the world of aesthetics including, The British Association of Cosmetic Nurses and The British Association of Sclerotherapists; Karen holds regular clinics throughout the year providing treatment for cosmetically unsightly leg veins. MEDICAL BACKGROUND – Karen qualified as a registered nurse in 1981, working in the NHS, she became senior sister in Manchester Royal Infirmary’s cardiac intensive care unit, where she worked for 7 years. During her extensive nursing career Karen also qualified as an American registered nurse and practised in the United States for three years. Karen has gained post graduate qualifications from Cardiff University as an Independent Nurse Prescriber. 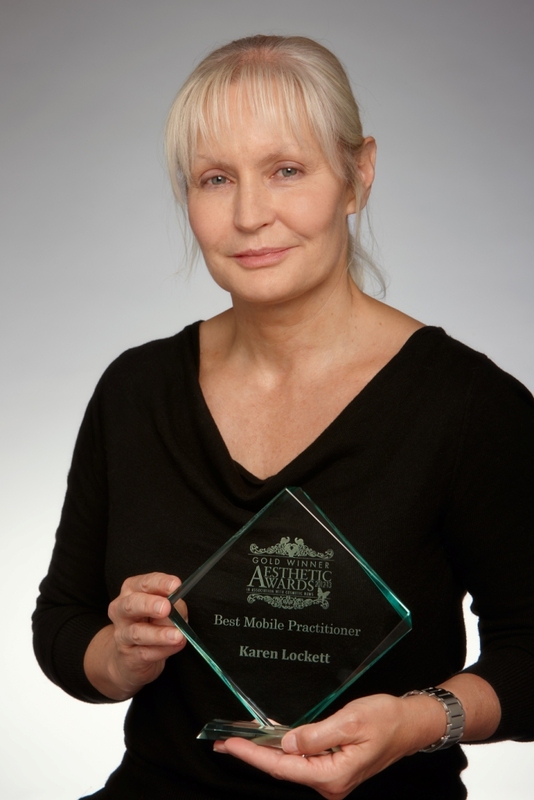 AWARD WINNING AESTHETIC PRACTITIONER – In December 2012, Karen was honoured to win ‘GOLD’ at the annual Aesthetic Awards, in association with Cosmetic News magazine, held at The Grand Connaught Rooms in London’s Covent Garden. To win, Karen was first nominated by industry peers to gain a position as a Finalist. Mystery shoppers then visited the shortlisted finalists, and their feedback, alongside votes cast by clients and industry colleagues determined the overall winner.